On a recent trip back to the house I grew up in nestled in the suburbs of Chicago, I found a little piece of my past. Ever since I left for college my mother has been telling me to empty my old room out so she can no doubt use it for something other than housing my old stuff. I was actually looking for a book by Mark Twain that I swore was buried in my closet. I didn’t find the book (it’s in there, lost amid a sea of randomness). I did find an spiral-bound notebook in relatively decent condition. In it were random entries of technical workouts I kept in the year 2000 in what would have been my sophomore year of high school. At 15 years old (I have an August birthday and was one of the only sophomores who couldn’t drive) I suppose I was meticulous. I laughed at the randomness of the entries. I ran my fingers over the ink and pencil and wondered what I was thinking back then. I suppose, this was my way of holding myself accountable. 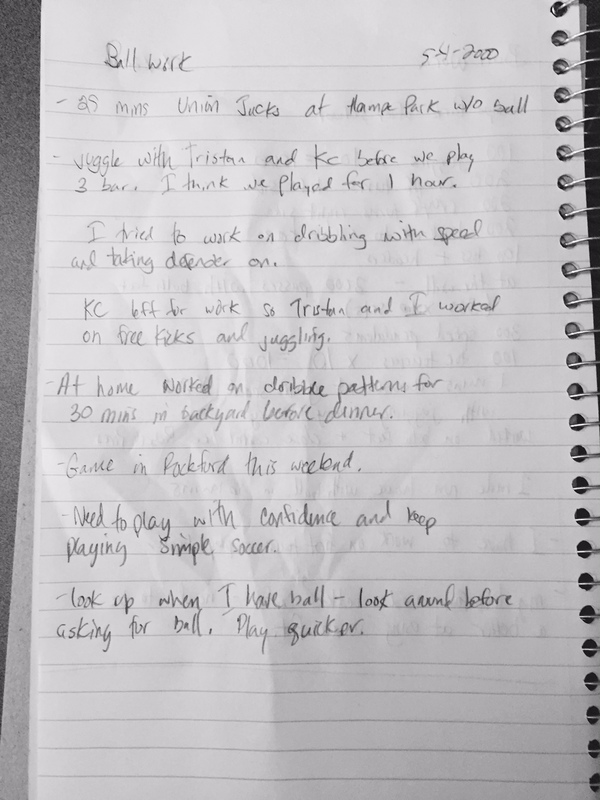 Through the chicken scratch and hurried entries was the basis for my 10,000 touches workouts that I depended on as a youth player. It was also a window into how seriously I took the game. After spending time in Europe getting a uniquely rigorous soccer education, I was conditioned to see practicing the fancy tricks was a waste of time. My individual training was geared and built on learning and mastering the fundamentals. Being a reliable teammate meant I had to have great distribution, footwork, and technical ability at the very least. I also needed to develop the soccer IQ required to play high-level soccer. I also knew I didn’t have a lot of opportunities in the game. Not compared to what kids have today with so much access and transparency that has evolved and improved with technology and progressive attitudes. Being recruited literally involved picking up the phone, sending an email over dial-up connections, sending in a paper bio and recruiting questionnaire, physically traveling to see coaches and visiting campuses, and praying you’d see someone from a college in the stands during a game. 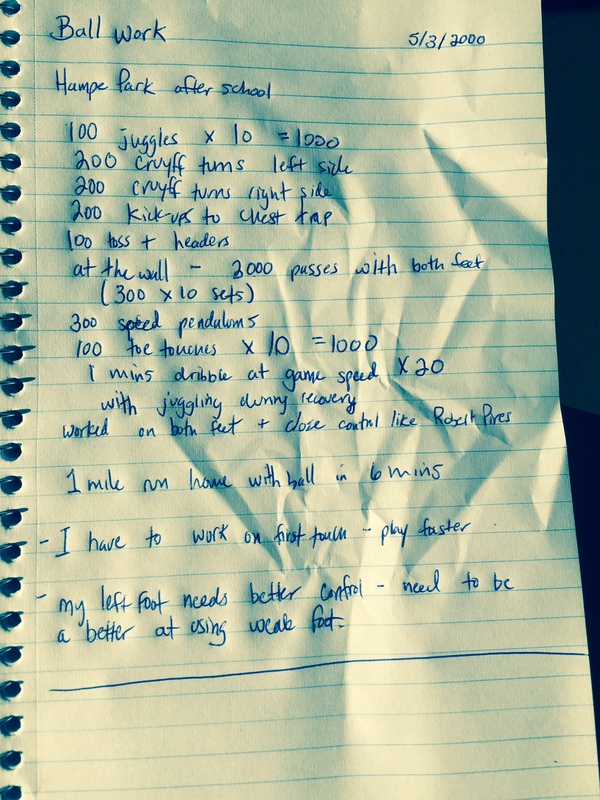 So, it’s no surprise to me that I figured writing down my workouts was a good idea because it kept me honest. I’ve spent the better part of my post-collegiate playing career still playing the game. I took a leap of faith in Germany’s lower leagues, played in a professional indoor league, and then got into coaching. I’ve worked with players to help them become the player they need to be for the next level. Many,if not all of them, aren’t of the ilk or ability to make it past high school soccer. To them, doing “enough” is good enough. Many of their shortcomings are lost in a sea of excuses and they are simply victims of a generation that prides itself on selfishness and trophies that don’t matter. But, most players don’t know to be obsessive with their training. Some of the best players I know we’re obsessive with their training and worked hard to make sure they always had a place in the team and hopefully on the field. I used to love when I got a new soccer ball. I’d actually take care of it — never leaving it outside in cold weather, checking it for punctures, inspecting the scuff marks. Why? Because I loved wearing it down to the point the panels would flake. I loved how the ink would fade off the surface until it was just a white orb that accompanied me everywhere I went. I loved that my friends called me “Soccer Jon” because I was rarely without a soccer ball. I trained in pouring rain, played 2v2 pickup in a foot of snow with my friend, Tristan and a few other buddies for hours in the winter. I would fly through my homework assignments and sneak out to meet the Hispanic groups assembling to play street soccer in a roller hockey cage. The Cage was a savage place. I played under the floodlights battling kicks, errant elbows, and gnats as often as I could to toughen myself up and get reps on my own. I also played high level club soccer with some of the nation’s best players. I have no doubt these guys were doing the same thing I was —supplementing our formal training and game competition with as much soccer as they could. Just about all of us went on to play Division I soccer somewhere. About 50% of the group played some form of professional soccer after college. A few of us still play at the weekend. The thing I’m most proud of is I never quit the game. College soccer was no fun ride. Nor was it a free ride. In fact, that environment was most likely where my love for the game was tested most. Playing time was earned and sometimes, the ball didn’t roll your way. Injuries at any point in a three-month season threatened to ruin it all. But, like many players around the world coming from less-than-ideal situations I wasn’t about to quit because something was difficult. If anything, playing Chicago’s CLASA and Metro leagues or various men’s leagues in soccer-rich St. Louis has helped reaffirm that to be good at anything you have to be consistent. Playing for teams who regularly compete in the opening rounds of the U.S. Open Cup was better than playing against the most loathed collegiate rivals. To be great at anything you have to be tough and resilient to the discomforts and unwelcome realities of the game. Part of what separates a player like the one I used to be (and maybe on the odd Sunday morning, I still am) and the next generation of players who “want to play college soccer or whatever the next level is) is the players I grew up with were willing to endure and persevere through the toughest of times. At most high level competitive environments, coaches aren’t there to be friendly. It’s a business-orientated and dictated job to all involved. There is no room for mental or physical weakness. For me, that was developed through being a diligent, accountable, hardworking, and tough individual. The game owes you nothing, but it will take everything from you without warning.